HONG KONG, Oct 29, 2018 - (ACN Newswire) - The Hong Kong Trade Development Council (HKTDC) announced today that it will lead 37 Hong Kong companies to join the inaugural China International Import Expo (CIIE), being held in Shanghai from 5-10 Nov. The companies will exhibit in two zones that will showcase Hong Kong's quality products and professional services and promote the city's capabilities as a leading international trading hub. Organised by the Ministry of Commerce of the People's Republic of China and the Shanghai Municipal People's Government, with the World Trade Organization, United Nations Conference on Trade and Development and United Nations Industrial Development Organization as organising partners, the CIIE consists of the Country Pavilion for Trade and Investment, the Enterprise & Business Exhibition, and the Hongqiao International Trade Forum. The CIIE is the world's first national-level expo to be set up with imports as the theme, aiming to open up new channels through which countries can strengthen trade cooperation and drive economic growth. The Hong Kong presence at the expo has been organised by the HKTDC, which has arranged for 37 local companies to exhibit in the Hong Kong Services Zone and Hong Kong Product Zone, promoting a wide array of quality products and services to international exhibitors and buyers. 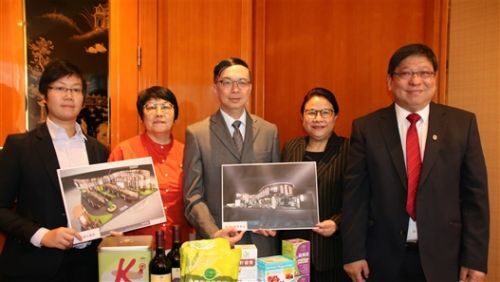 Stephen Liang, Assistant Executive Director of the HKTDC, said: "Many Hong Kong products and services have already established a strong reputation in the Chinese mainland over the years, our safe, reliable food products and provision of world-class professional services being just two examples. We see there is huge market potential for such products and services in the mainland. In line with the country's drive to open its import markets to the world, we believe Hong Kong exhibitors at the expo can reach more potential buyers, expand their mainland presence, and discover new business development opportunities." The Hong Kong Services Zone consists of 15 Hong Kong exhibitors showcasing a range of Hong Kong professional services, covering areas such as construction, logistics, marketing and professional licensing, accounting, information and communication technology, and hospitality. Government-funded institutions and professional societies will also have a presence in this zone. With green living as its theme, and featuring an open design, the Hong Kong Product Zone spotlights food and beverage products from 22 Hong Kong companies, comprising some 30 exhibition booths to promote quality food items made in Hong Kong. As the Hong Kong exhibitors get ready to showcase their products and services in Shanghai, representatives from four of the companies involved talked to the media today about their aims and expectations from participating in the expo. The main business scope of Sedgwick Richardson (Hong Kong), one of the exhibitors in the Hong Kong Services Zone, is branding consultancy. March Richardson, the company's Group Director, said she is aware of the growing demand for branding services in the mainland and hoped that Sedgwick Richardson could use the expo to expand its presence there, helping to raise the brand awareness and preferences of various mainland companies on the international stage. Eva Chan, Vice Chairman, Smart City Consortium eID Committee, said she hoped their company could use the expo as a platform to find new business partners and expand their presence as part of the many developments taking place under the Belt and Road Initiative. All Time Healthy, one of the exhibitors in the Hong Kong Product Zone, will showcase its latest Sin-Free Sugar product at the expo. Ken Wong, Director of the company, said that market tastes are shifting towards more healthy foods and hoped the expo would enable them to promote quality nutrient food products across the mainland. Karen Wong, Corporate Development Manager of Kampery, hopes to showcase the best tea, coffee, organic health products and red and white wines through participating in the expo. They also hope to promote Hong Kong's milk tea culture to the Chinese mainland, helping to build a more enduring connection with mainland companies and foster cross-sector collaboration to reap mutual benefits. One of the highlights of the CIIE is a seminar entitled "Hong Kong's Experiences for International Trade: New Horizon, New Technology, New Model", which features industry experts from the innovation and technology, finance and legal sectors. They include Victor Fung, Group Chairman of the Fung Group, Herbert Chia, Expert Partner of Sequoia China Fund, Lin Guang Ming, Chief Corporate Banking Officer of the Bank of China (Hong Kong), and Lawrence Yeung, Member of the Greater China Legal Affairs Committee and The Law Society of Hong Kong. They will explore issues including big data applications, the Hong Kong financial services industry's support for cross-border enterprises, and Hong Kong's risk management professional services, highlighting possible roles for the local service industry in international trade.